William Marriott Museum01263 820800work MuseumThe William Marriott Museum building houses many artefacts, documents and other bygones from the age of steam in East Anglia. 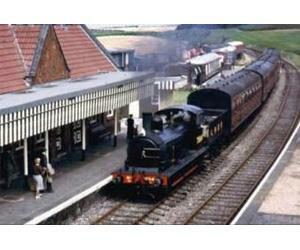 Outside, the full 5 ¼ miles of the Poppy Line are packed with a multitude of working museum items, such as the buildings and general railway infrastructure, the locomotives and rolling stock and a truly historic signalling system. The William Marriott Museum building houses many artefacts, documents and other bygones from the age of steam in East Anglia. Outside, the full 5 ¼ miles of the Poppy Line are packed with a multitude of working museum items, such as the buildings and general railway infrastructure, the locomotives and rolling stock and a truly historic signalling system. William Marriott, was the man who built and went on to run the railway for 40 years. Marriott has often been called the "Father of the M&GN", with just cause, and the Railway gained the title of "Marriott's Tramway" in some quarters.